This soccer shoe is designed for the kicksguide contest with the theme "Bend it like Beckham". I used Adidas cause the main sponsor of Beckham is Adidas already. The shoe have special breathing and cooling fabric so the feet's don't get too hot. It have a flap covering the laces and is strapped down with velcro. The rear of the shoe have special carbon with flexible and hard area's, made with a special way applying different resin. This way the shoe is light but also got a strong heel protector. 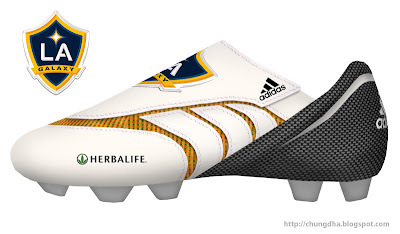 Cause of the clean and simple shape there are allot of area's left for sponsoring, that why the sponsor and the logo of Beckhams team LA Galaxy is applied. This contest ends 8/19/07.